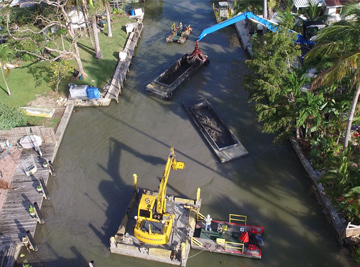 Dredging of approximately 25,000 CY of sediments containing PCB’s and NAPL from an area adjacent to shore and extending into the navigation channel. Control and monitoring of sediment re-suspension during sediment removal. Dewatering, characterization, and conditioning of sediments for offsite disposal. Construction and O+M of a 100 GPM water treatment plant to process all water generated during remediation. Placement of an engineered sand/organoclay cap as well as multilayer armor protection upon completion of dredging. River Raisin was designated an Area of Concern (AOC) under the 1987 Great Lakes Water Quality Agreement. The agreement is a commitment between the U.S. and Canada to restore and protect the water of the Great Lakes. The River Raisin AOC project is located in the southeastern portion of Michigan’s Lower Peninsula in Monroe County. The USEPA defined the AOC as the lower 2.6 miles of the River Raisin, beginning downstream of the low-head dam at Winchester Bridge in the City of Monroe. It extends approximately 0.5 miles into Lake Erie, within and adjacent to the federal navigation channel, and continues along the nearshore zone of Lake Erie, north and south, for approximately 1 mile. This project specifically addressed removal of TSCA level PCB-contaminated sediments within an approximately 1.45-acre portion of the AOC. After mobilizing equipment, supplies, temporary facilities, and personnel to the site, Sevenson designed, constructed, operated and maintained a 100-GPM temporary waste water treatment system to treat construction water generated during work activities. The system treated all water generated by sediment dewatering, mechanical dredging, and decontamination operations, as well as accumulated runoff collected in the Sediment Processing Area (SPA). Sevenson obtained an Industrial/Non-Domestic User Discharge Permit form the Monroe MWPCF. Before commencing sediment removal operations, Sevenson conducted pre-dredge debris and hydrographic surveys. Dredging occurred in water depths ranging from less than 1 foot (adjacent to the shoreline) to approximately 37 feet (in the Navigation Channel). 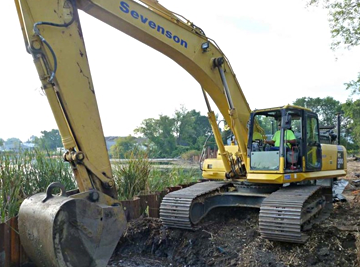 Sevenson successfully dredged 24,800 CY of PCB-impacted sediment; placed cover material over a 0.3-acre area and installed an engineered cap over 1.15 acres. Throughout the course of the project, Sevenson implemented real-time air monitors to ensure that particulate matter did not impact on-site personnel. 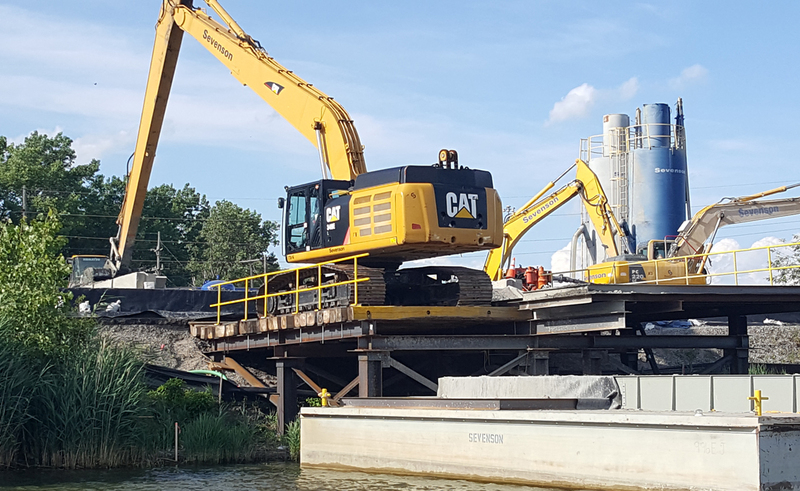 Upon completing dredging activities, Sevenson performed confirmatory multi-beam surveys to verify and document that targeted volumes of contaminated sediment were successfully removed. 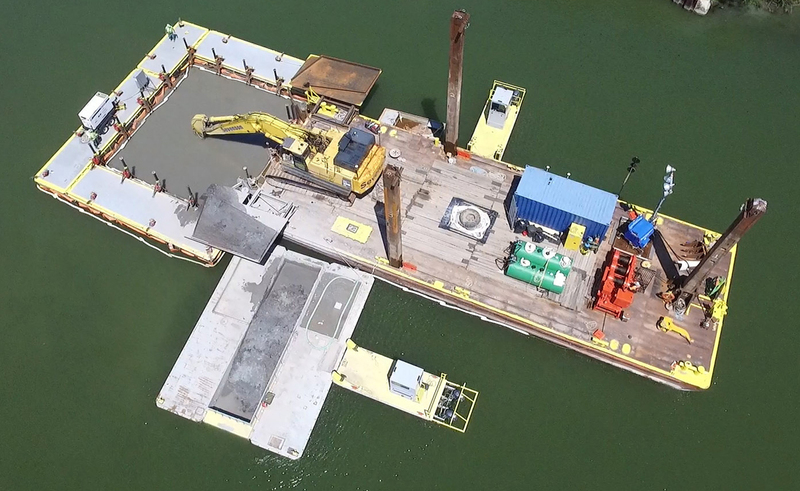 Sevenson transported dredged debris and sediment to the loading/offloading pad via scows, which then transported the contaminated material to the SPA. 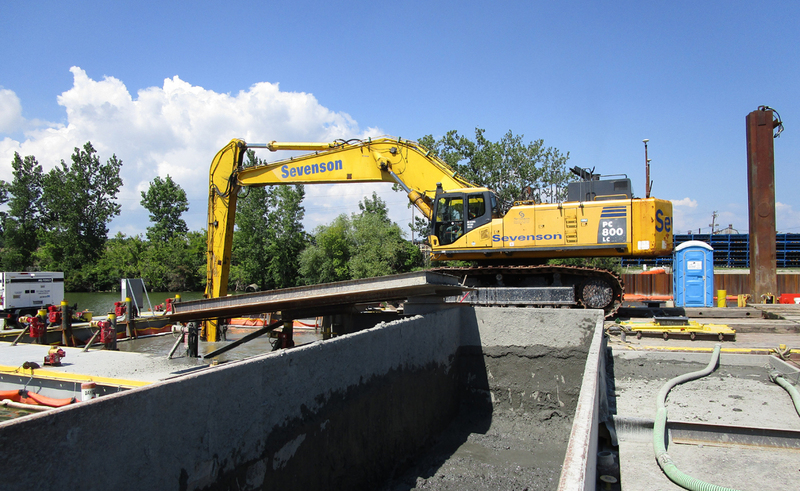 Sevenson placed dredged sediment onto the SPA to facilitate gravity dewatering and so that field crews could separate large debris for disposal. The SPA also served as the site where crews amended with Portland cement. The offloaded and dewatered/amended material was stockpiled and placed into bins while awaiting transport by truck to the disposal facility. The staging of sediment was managed within the SPA, allowing Sevenson to sequester and treat all water within the stockpiling area. Water released from stockpiled material was pumped directly to the on-site water treatment system. Sediment dredged from the NAPL Area was TSCA level material. Under TSCA regulations, PCB-contaminated material (including sediment) containing or exceeding 50 ppm must be disposed of at a hazardous waste landfill permitted under the Resource Conservation and Recovery Act (RCRA) or at a TCSA-approved chemical waste landfill. Dredging, backfilling, and capping typically provoke resuspension of sediment and chemical constituents, thereby increasing turbidity issues and chemical concentrations in the water column. Sevenson was also cognizant that the presence of NAPL in the materials being dredged would produce a sheen in the dredge area. To address these short-term water quality issues, Sevenson implemented the necessary measures to meet the applicable water quality criteria. 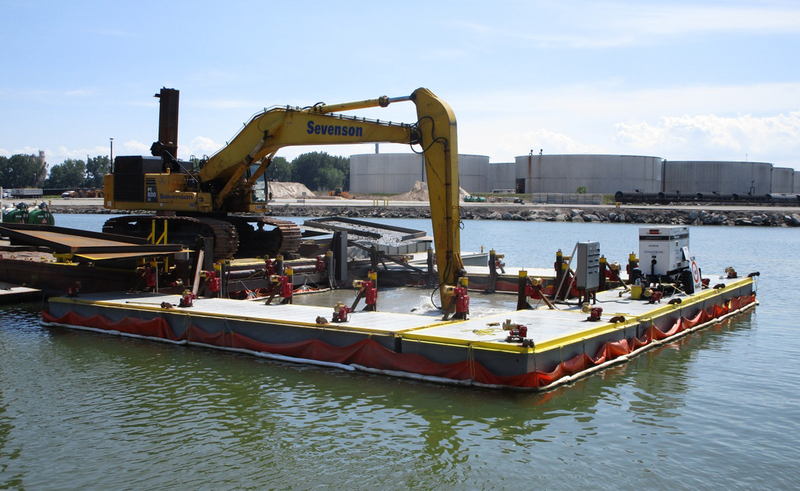 Sevenson utilized an innovative method of containing all NAPL during dredging activities. A moonpool was used during all dredging activities. The moonpool system was constructed of a square group of sectional barges with an interior and exterior turbidity curtain installed around the interior and exterior perimeter of the barge sections. The interior curtain was non-permeable and the exterior curtain was permeable. A system of telescoping spuds were used to lower and raise the curtains as needed according to the water depth. Sevenson also performed real time turbidity monitoring 24/7. Upstream and downstream turbidity monitors were used to measure in river turbidity levels during all dredging activities. 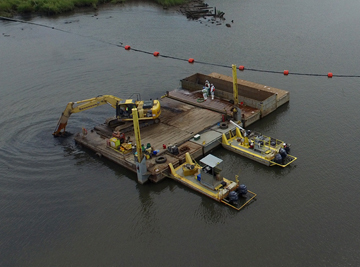 Sevenson’s scope of work also included installation of an engineered cap over 1.15 acres of post-dredge surfaces. The engineered cap consisted of a sand residual cover layer, a 4% sand/organoclay mixture with a minimum thickness of 12”, a filter stone layer with a minimum thickness of 12”, and an armor stone layer with a minimum thickness of 36”. All capping layers were verified with a multibeam hydrographic survey. Three long-term monitoring ports were also installed within the cap footprint to allow for future testing access. Sevenson utilized a system of feed hoppers, a variable speed conveyor, a quad screw mixer, and a stacking conveyor upland to achieve a reactive layer mixture of 4% Organoclay and 96% sand. The organoclay/sand mixture was mechanically loaded into hopper scows and transported to the cap area, where a PC 800 placed the material with a clamshell bucket. The filter stone and armor stones were loaded onto deck barges and transported to the capping area for subsequent placement. Filter stone was placed with a clamshell bucket and the larger armor stone was placed with an orange peel attachment. The Port of Monroe is an active waterway that provides access routes for two to four commercial vessels each week. Additionally, recreational boaters frequent this section of the River Raisin on a daily basis. Both commercial and recreational boat traffic passed by the work area along the southern portion of the navigation channel outside the NAPL Area. Sevenson worked with Port of Monroe, USACE, Lake Carriers Association, and commercial freight authorities to coordinate dredging operations so as to ensure work activities did not disrupt marine traffic. Sevenson regularly apprised authorities of project schedule objectives and updates regarding ongoing work. After confirming that remedial objectives were achieved, Sevenson commenced decontamination, site restoration, and demobilization activities. Field crews removed resuspension controls from the river; dismantled the loading/offloading pad and drip apron; decontaminated all equipment, tools, and the SPA; and pumped residual water to the on-site treatment system.